From the mid-1800s to the mid-1900s, the United States was one of the true powerhouses of watch manufacturing in the world. Rather than the British or Swiss approach to making watches to that point, where individual craftsmen churned out specific kinds of parts, which were assembled (after much tweaking) by the actual watchmaker, the US embraced the idea of mass production through industrialization. 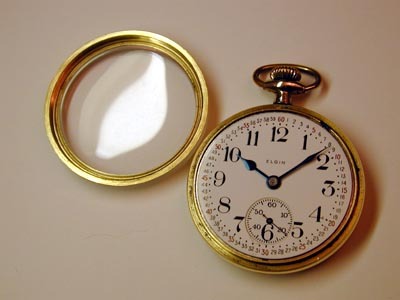 The fact that the American Railroad Pocket Watch eventually was produced in the hundreds of thousands via these factories, while equaling or outperforming the best Swiss chronometers made for everyday use (i.e. not observatory trial specials), speaks of the success of that approach. The original idea for a watch movement, which could take interchangeable parts made by mass production, appears to date from 1838, with the Pitkin company in Hartford, Connecticut. However, it was a few years before companies which made watches by this method were successful competing with hand-made watches. 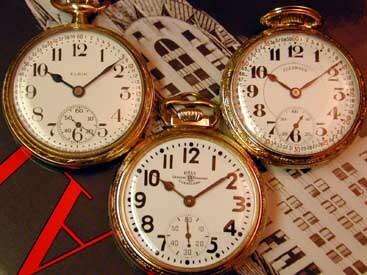 One of the earlier successful companies, the American Waltham Watch Co., had by 1891 made 5,000,000 watches with an annual production of several hundred thousand per year. According to Shugart’s “Complete Price Guide to Watches”, 1891 was also a significant year for the watch industry for a horrible reason – in April, a major train collision occurred outside Cleveland, Ohio, as a direct result of a faulty watch being used by a railroad engineer. Unlike today’s rail or air traffic control systems, which rely upon real-time sensor readings distributed throughout the rail or air networks, separation of trains from each other was done almost entirely by schedule. All trains needed to start or stop at predetermined times, or disaster would strike. To address the public concern over safe train travel, the railroads appointed a commission, headed by Webb C. Ball, to determine how the railroad schedules could be kept safe. His solution – make more accurate and reliable watches. Ball established a set of generic standards for railroad watches, that were individually adopted by railroad companies (sometimes with modifications), who in turn ordered all of their employees associated with keeping railroad schedules to purchase watches to these standards. Unfortunately, while this is a very compelling story, it has been reported that this story was, in fact, the result of a syndicated column by James Morrow from 1910, based on an interview with Webb C. Ball (who obviously had some vested interest in playing up his role in the matter.) Mr. Ball failed to remember many of the details of the accident nineteen years after the fact, and in actuality, the railroads had set up time standards rules and requirements as long as several decades prior to the 1891 crash. It should be noted that despite the biased nature of the newspaper article, Ball was definitely a figure in the development of more unified time standards. He also set up a watch company in Cleveland to sell watches for railroad service [conflict of interest thus proved to exist in the 19th century ]. Rather than actually manufacture watches, he contracted with several watch companies, who made movements to his specification, sold under the “Ball Watch Company” name. Another unfortunate consequence of the newspaper story is that one gets the impression that watch companies needed to improve their product to meet the new standards. In reality, the watch companies added features, which were formally or informally validated over time as to their benefit (or lack of benefit) in service, before the features became standard. 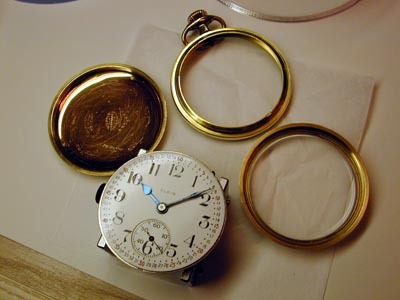 Over time, the requirements for these watches changed – eventually only open-face watches were allowed, fewer 18 Size movements were allowed, and the minimum number of jewels needed to be increased. These watches were subject to regular inspections for timekeeping accuracy and proper function. The constant in all of this was that railroad watches needed to maintain a standard of timekeeping of less than 30 seconds of error over a week. In fact, many older watches were grandfathered as long as they were able to meet this standard, even if technically they were obsolete. Regardless of whether the railroads led or followed the standards evolution, they were the driving force behind the creation of the most accurate and reliable watches yet manufactured in the world, and the US companies would remain at this pinnacle until the bitter end: the utter collapse of the US watchmaking industry in the 1960s. [Illustrations: Top Left (L to R): Elgin B.W.Raymond, Ball-Hamilton, and an Illinois Bunn Special. The Elgin Watch Company – Who was BW Raymond? Elgin was originally called the “National Watch Company”, but in 1874, they changed their name to the “Elgin National Watch Company” because that was what most of the watch trade and public was calling them. They kept that name until the mid 1960’s when they got out of producing watches and changed their name to the “Elgin National Industries”. 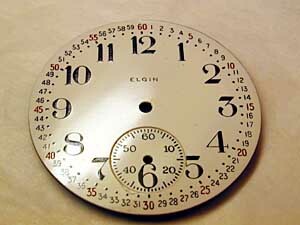 Elgin was founded on the idea of mass producing high quality watches using machine made, interchangeable parts. Up until around 1850, watches were made mostly by hand, which meant that if a part broke, you had to find someone with the tools and skill to make a new one. Elgin realized that there was a large market for good watches that could be sold and repaired relatively cheaply using factory made replacement parts that didn’t require hand adjusting. Elgin never made the highest quality watches in the world, nor did they make the cheapest, but together with Waltham (aka The American Watch Company), they dominated the vast middle ground of the watch market. I’ll only add that the watch company was founded in Elgin, Illinois, which borders Chicago on the west side. To give an idea of how large Elgin’s market was, during the period 1910-1928, Elgin made close to 1 million watches each year. Watch companies in the US tended to name their highest grade movements after the company founders and/or investors. Benjamin W. Raymond was one such individual, as he was a former mayor of Chicago who put together the team of investors which got the company off the ground. 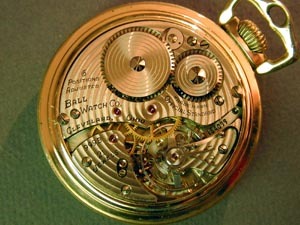 The name “BW Raymond” was bestowed on the very first movement built by the company, and was reserved for the company’s railroad grade pocketwatches. Other railroad grade movements made by Elgin included the “Veritas” [Latin “truth”] and “Father Time” models. Railroad grade models often had elaborate damaskeening, or decoration – much more Baroque than Geneva waves. This particular 19 jewel movement was made starting around 1917, and a total of 64,000 movements were made; production of this movement ceased around 1921. The movement is a “16 Size” [43.18mm or 19 1/8”’], and is quite thick (although not unusually for the time). Per railroad requirements, the watch was adjusted to 5 position, temperature, and isochronism, and carried an overcoil hairspring. In good condition, these watches are a bargain today at around $300-$400. The construction of this watch shows many inconsistencies from visible components to the underside of components. This is true much more for this watch than for either of the other railroad pocket watches in my collection. However, in other areas, there are some really nicely finished and executed individual parts – even unseen pieces. Rather than attribute this entirely to “display back” syndrome, I’ll suggest that it is at least partially due to the mid-level nature of Elgin’s production, combined with some “parts bin” mentality. I’ll point this out in a few cases as we go along. The watch movement itself shows quite a bit of scratching and wear from previous services – the inside back of the case shows that this watch was actively serviced over its lifetime – unfortunately, the watchmakers who serviced it didn’t always handle it with the best of care. After 1900, railroad regulations required that dials use large arabic numbers, black on a white dial, with appropriately bold hands. The canonical hands for railroad use became the “spade” hands – which have an hour hand reminiscent of the ace of spades. However, there were many variations of hands which found their way into railroad service – from simple baton hands used on certain high-grade Hamiltons, to elaborately shaped diamond hands used by Illinois on their top-of-the-line Sangamo Special, to the partially skeletonized hands used on Ball watches made by Illinois. The photo at left shows a hand remover – with a special center mechanism to push against the center wheel arbor. Despite being advertised as being able to remove hands without touching the dial, putting a layer of tissue between the hands and dial is always prudent. The black-on-white requirement for the dial meant that railroad watches primarily used enamel dials, with a few metal or painted dials as the exception. 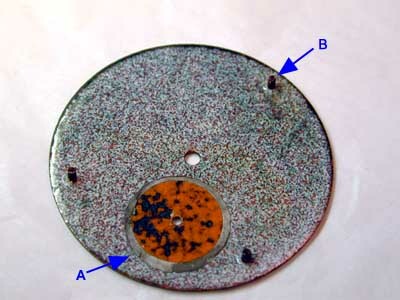 An enamel dial started out as a disk of copper. White enamel powder is sprinkled evenly over the top face of the dial, which is then baked in an oven at very high temperatures for only a few seconds. During the firing, the enamel powder melts and forms a glassy coating on the dial surface. Interestingly, the copper in the dial would melt if the enamel powder were not there to absorb the excess heat through it’s phase change from solid to liquid. 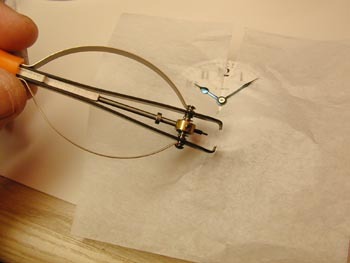 This process is repeated several times, and then the dial is removed and sanded smooth. 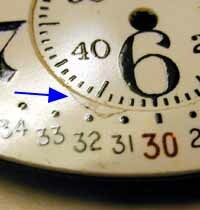 Once sanded, the numerals and other markings on the dial were either painted on by hand or silk-screened, using a colored enamel paste. This was then fired again in the kiln to provide a durable finish which would withstand exposure to oxidation, moisture, or dust. 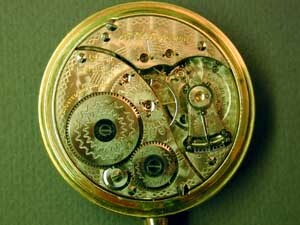 Most dials were made of at least two parts – the main part of the dial and a “sunk” subsidiary seconds. This was achieved by drilling a hole in the main part of the dial, and soldering a smaller enamel disk made in the same way. Other dials were so-called “double-sunk”, with a second sunk area on the inner part of the dial for a more elaborate appearance. The one area where enamel dials are vulnerable is to actual physical abuse – since enamel is a layer of glass bonded to metal, it will potentially crack or chip if the watch or dial is dropped or otherwise mishandled. However, even cracked dials won’t shatter, as the glass will remain bonded to the copper substrate. As you can see in the photo on the left, this dial has a small “hairline” at the edge of the subsidiary seconds dial. This particular style of dial, with each minute labeled (with red labels for five-minute increments) is known as a Montgomery dial. These became popular around 1910 with railroad men, but were far from the only style approved. All of the watch companies varied their designs over time, some showing a simple, easily readable style (e.g. the “Boxcar” dial used on Ball watches), others tried for more aesthetically pleasing modern or traditional number shapes, such as the neo-gothic numbers on the Illinois Sangamo Special. There was one other railroad variation – the Ferguson dial – which looks like a white-dial version of the WWII B-Uhr, which had small hour figures on the inside and a big minute track and markings on the outer perimeter. These dials never caught on with the railroad community and are thus rare (and collectable) today. Unfortunately for the collectors market, there are modern reproductions of enamel dials being made in Switzerland today; a collector must be very careful when evaluating whether the dial is original. In fact, the dial on this particular watch may not be original to the watch, as Elgin seems to have sold the BW Raymond with a double-sunk dial until 1923; however, it does NOT appear to be a modern reproduction. 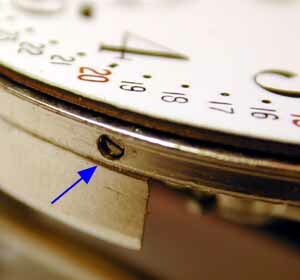 The dial is removed from the watch by loosening three small screws in the side of the bottom plate (right). These screws secure small feet which are soldered to the back of the dial. The back of dial from the Elgin is shown below; it has been given a simple speckled enamel finish, reminiscent of antique washbasins. 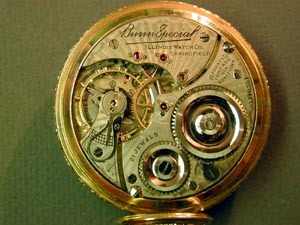 Visible in the photo are the subsidiary seconds disk (A), and the feet for holding the dial to the movement (B).